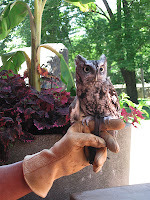 Yesterday we took a trip to the Toledo Zoo with a friend. The zoo provides ample places to eat whether it is food that you have brought with your, or food you have purchased at the zoo. We tend to pack a lunch and then get ice cream as a treat before leaving. The zoo continues to expand its population as well. They have a new polar bear cub Siku born December 3, 2009. He is the only polar bear cub currently in a US zoo. Due to the popularity of Siku, there is a line setup to enter the polar bear exhibit. The line starts near the polar bear fountain and is marked by a large overhead sign. At crowded times, the interior of the polar bear exhibit can only be accessed from the line. We opted to save the polar bears for the end of our trip. While the lines were still marked, there was direct access to the polar bear exhibit. The zoo continues to improve their facilities. This was our first trip to see the elephants in their new enclosure. The new enclosure allows you go view the elephants from a shorter distance. The new enclosure is between the hippoquarium I do not know if they will continue to use both enclosures since there is no water in the new enclosure. It is nice that you can now go see the elephants without having to go through the whole trail. 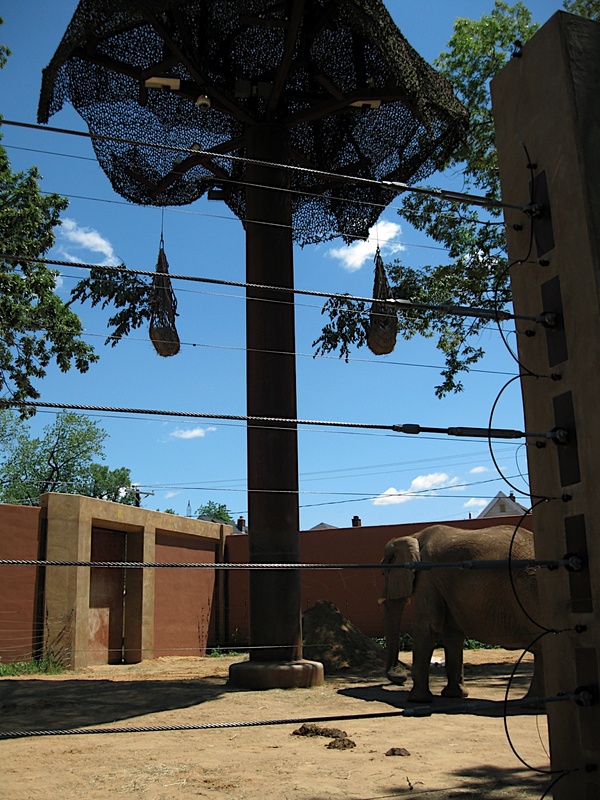 In addition to the new elephant enclosure, we could hear work going on in other portions of the zoo. One downside to construction or other event planning, is that there were tractor trailers parked on the sidewalk next to the animal masks near Nature’s Neighborhood making the walking area extremely tight. The zoo was much more active than it usually is on weekdays during the school year. There were lots of staff around with animal pelts, small animals, and activities. We got to feel a polar bear paw, a giraffe skin, a wolf pelt, and a few others. 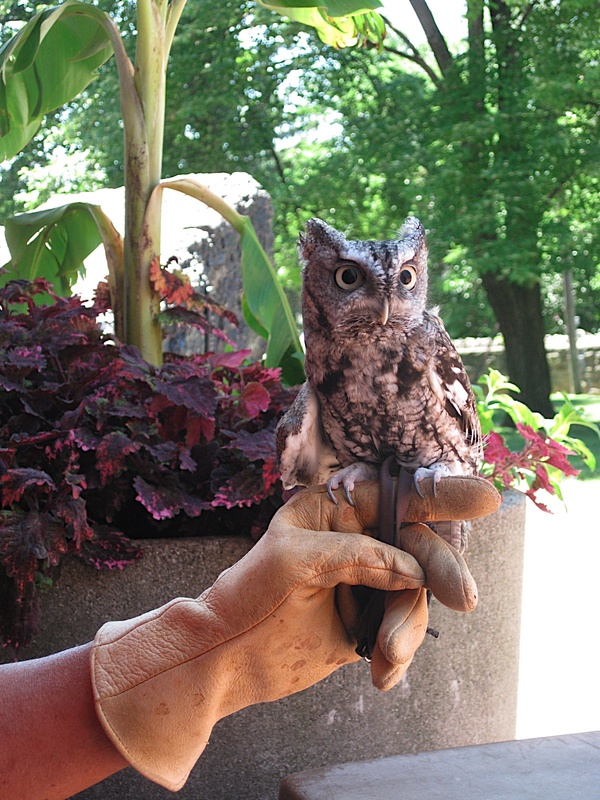 We also got to meet an owl. The kids even got to play a True/False game about Polar Bears. As always, my daughter had a great time at the Nature’s Neighborhood children’s area. The stream was open and she had a great time showing her friend how to pan for rocks. She was having such a great time that she was oblivious to the fact that her dress was trailing in the water when she bent down. Next time, I’ll remember to have her wear shorts instead. Each time we go, she gets braver about interacting with the guinea pigs. When it first opened last year, she would just peek at them. Now, as soon as she crawled through the door she sat right down on the bench and grabbed a brush and a carpet to take a guinea pig in her lap & brush its hair. The extra staff was also present in Nature’s Neighborhood. They had a lot of extra activities setup in the classroom. The classroom theme was sealife. My daughter made a seascape with fish, dolphins, and sea plants in a plastic box. They also had a chance for them to explore deep water or a coral reef in the form of large tent-like sacks that were blown-up by fans. The kids could crawl in and they were filled with sample sea-life and decorations. Make plans to go see Siku at the Toledo Zoo. Be sure to take time to spend at Nature’s Neighborhood. Your kids will love it.